A new poll reported by your buddies at Bloomberg News says most Americans want to stem the flow of Syrian refugees into the U.S. because they don’t believe the federal government is doing enough to protect the homeland from an attack like we saw in Paris last week. Only a handful of governors say they trust the fed’s mind-reading prowess enough to welcome without question Syrian refugees within their state borders. 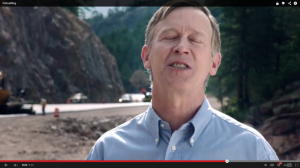 Hickenlooper, ever the Obama boot-licker, is one of those governors. Hick was asked by Mike Rosen this week to explain his position on the refugees, some of whom are implicated in the Paris attack, others who are accused of bombing a Russian commercial airplane, and still more who are killing Christians. Hick’s reasoning that U.S. policy should not be reexamined to respond to terrorist threats is mind-numbingly naïve. It would be funny, if it weren’t so serious. And a little dangerous. « AG CHALLENGES GITMO MOVE: Will Hickenlooper Take Coffman Back to Court?